Whereabouts is bubbly & brazen Basira Yeusuff, whose pâté pan mee at Agak Agak forever blighted this writer's impressions of all others? The last we heard from the chef, she was gallivanting around Korea in search of good pork-free eats. As if the internet deities were eavesdropping, we stumbled upon Agak Agak Seoul on Instagram. And by an even bigger stroke of luck, the chef was in KL to settle a few things before the restaurant's grand opening. We scheduled a tête-à-tête over coffee and sourdough to discuss her game plan. "My catering company Root Cellar KL is a well-oiled machine of its own," begins Basira. "And whenever I start to get bored, I bugger off! I wanted to do a stage but not in Europe, as I've already been there and done that. I don’t know if you’ve noticed, but it feels like things are coming back to Asia; this is where it’s at! I knew that the Michelin guide had arrived in Seoul not too long ago so I went to check out the city last year." If Berlin and Bangkok had a baby, it’d be Seoul. "Save for Singapore, I never knew a single soul in any of the cities I moved to. Six months later, I find myself strangely comfortable in Seoul. I can even go to the pasar and bargain! I was never crazy about Korean dramas and all that, so I couldn’t understand some things, but I was, and still am, pleasantly surprised by the city. The public transport is tip-top, but it's still got grit and character; it’s neither clinical nor cold." "Oh, good lord!” she exclaims comically when I comment on how fast things have sped along. 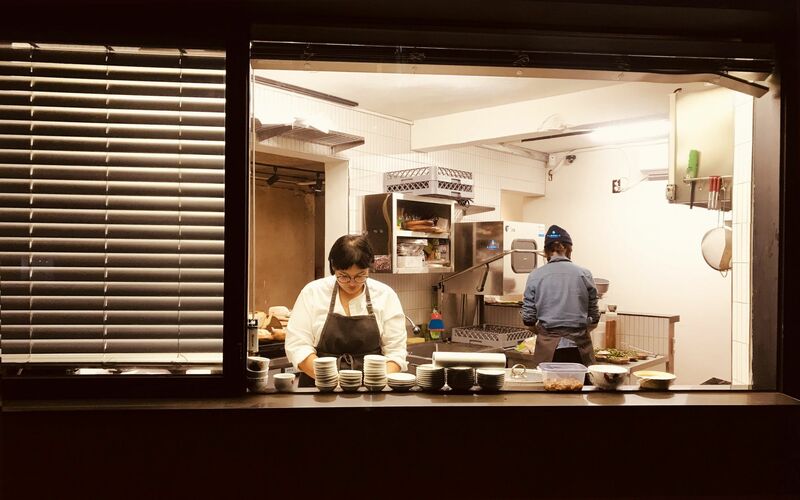 After all, she's only lived in Seoul for mere months, initially to fill the shoes of a stagiare at the 1-Michelin star restaurant Soigne Seoul. "If you’d asked me what my plans were 8 months ago, I wouldn’t have been able to tell you. Some have even asked if I’m sure I’m not being taken for a ride." She makes a show of pinching her forearm. "I arranged a viewing of a cute rooftop space, thinking it would be fun to hold a nasi lemak pop-up there. After, the Koreans owners asked if I could spare some 20 minutes to see another space." As it turns out, the proprietors had Googled her and learned of her stature in KL. "So we take a stroll to this other shoplot and they ask if I wanted to set up an eatery there and then. My expression was deadpan, but inside I was going, Haaaah!" she says, mimicking that cartoon sound effect when a light shines down from the heavens. Agak Agak Seoul has found a home in Yeonnam-dong, which Basira likens to Bangsar or Taman Tun Dr Ismail — a hotspot, if you will. Seating some 28 diners, the restaurant is sandwiched between a bar and a barber. “Me and barbers have a thing!” she enthuses, alluding to Agak Agak APW, which had been neighbours with 52 Barbers. Above the restaurant are a travel bookstore and a coworking space. "I’m trying to bring in Malaysian mojo, so I’ve acquired some pieces, including an acrylic painting that will be the focal point of one wall, from local artists such as Kide Baharudin, Miriam Omar and Stephanie Yong." Ayam goreng berempah was the first dish that made it onto the menu, which comprises some 12 items including drinks. "I know that that's going to take off, especially paired with soju," says Basira with confidence. "The second confirmed dish was laksa, but I didn’t want to do kari laksa as there was already roti canai with curry on the side. So I decided to do a Nyonya-style laksa, which works well since seafood in Korea is the bomb." Culturally, Koreans enjoy cold over hot drinks. "Even if it’s 12 degrees outside!" she exclaims. Malaysian staples such as teh tarik ais, kopi ais and sirap limau will be pre-bottled every morning, so customers can help themselves to the chiller while Basira concentrates on the cooking; it will be a one-woman show in the kitchen, after all. "Manpower is so expensive," she sighs. "We’re getting two part-timers for the front of house, but in the kitchen it’s purely me." "You know what I find most weird, comforting and amusing about Korean culture?" asks Basira. I half expect some running commentary on men wearing makeup, but that's not it. "Koreans can feel very Malaysian, but old-school Malaysian, like in P Ramlee movies," she says, smiling fondly. It also seems that Koreans are not nuts about coconuts. "There dislike two things with a vengeance," reveals the chef. "Coriander and santan. During our second or third test kitchen, there was laksa on the table and several didn’t touch it. I found this mind-blowing especially after trying the local fermented skate." It apparently smells like rotting flesh. "But I have to stand my ground instead of catering to the Korean palate. Why would you hire a Malaysian chef and have me make 'Koreanised' food?" Thankfully, her well-travelled investors could see where she was coming from. "Their feedback has been, 'Let Basira do her thing.' There is nothing like Agak Agak Seoul in Korea at the moment — this will be the very first of its kind — so why would you want to water the flavours down? I am good with standing my ground. I also don’t want Malaysians to visit and think, 'What the f*** is this?' or say, 'It’s okay lah for Seoul.' That would kill me." Agak Agak Seoul is slated to open at the end of April 2019 to coincide with the new spring.